How Do Weapons Makers Sleep at Night? 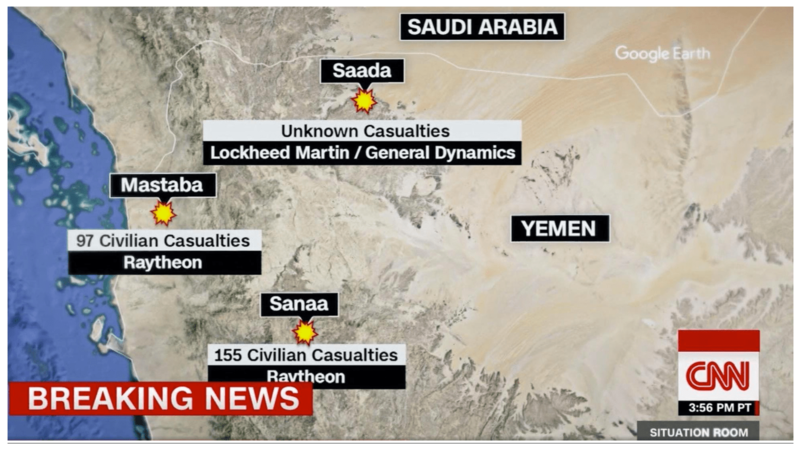 A new report by Medea Benjamin and Nicolas Davies "focuses on the five largest U.S. arms manufacturers -- Lockheed Martin, Boeing, Raytheon, Northrop Grumman and General Dynamics -- and their dealings with three repressive nations: Saudi Arabia, Israel and Egypt." This may prove to be a very valuable approach. The three nations reported on use U.S.-made weapons from the companies listed above to kill, injure, and traumatize huge numbers of innocent people both in other countries and in their own countries. The U.S. government works to make sure the weapons sales and deliveries happen, knowing full well what the weapons will be used for, often training the militaries involved, and often actively participating in the killing as partners in a war. Benjamin and Davies could, of course, have focused on what the U.S. government itself does on its own with weapons from these companies. But then, who would have been able to lift the full report without assistance from heavy machinery? And how many people would have thrown up barriers to understanding it, in the form of flag-waving patriotic horseshit? When the United States does something, it's by definition acceptable, even admirable. But when the United States does it, it's often justified by the excuse that some other country committed some outrage -- usually against its "own people," which is apparently far more terrible than against some other people. So, the U.S. public is used to hearing accounts of just the sort of things that the Egyptian, Saudi, and Israeli governments do as justifications for bombing poor distant lands. There is no danger of the United States bombing its top customers and proxies, but there is the potential for millions of U.S. supporters of militarism, including millions of employees of weapons dealers, to lose the association of militarism with patriotism, and therefore the justification of mass murder as somehow good or noble. Foreign mass murder tends to look more like what it is. Perhaps some weapons workers will find other employment. Or perhaps, as the authors intend, some funds will be divested from those profiting from death.